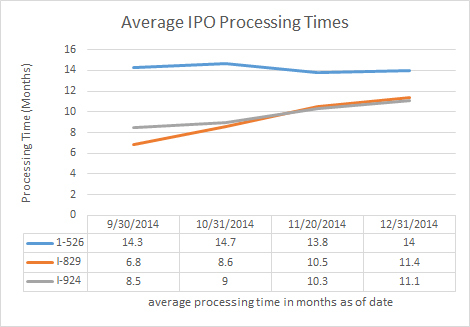 Newly-released processing time information for the Investor Program Office shows slight increases over the previous quarter to average processing times for all EB-5 petitions and applications. 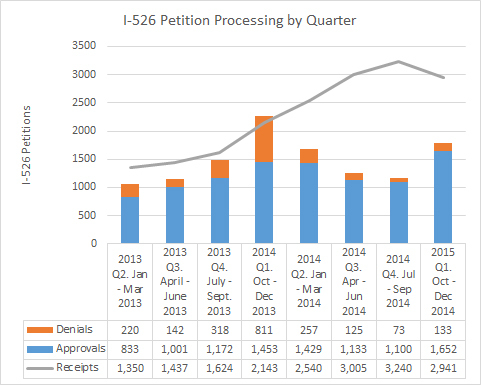 The big story behind these numbers comes in the statistics on processing volume for the end of 2014 (USCIS’s Q1 2015), which shows a number of surprising trends: 1) the first fall I can remember in the number of I-526 petitions received; 2) a sizable increase in the number of I-526 petitions processed; 3) a near stand-still in I-829 adjudication. The California Service Center got 690 I-829 petitions out the door in the previous quarter, before the hand-off to IPO, and IPO has processed only 69 I-829s since taking over the task. 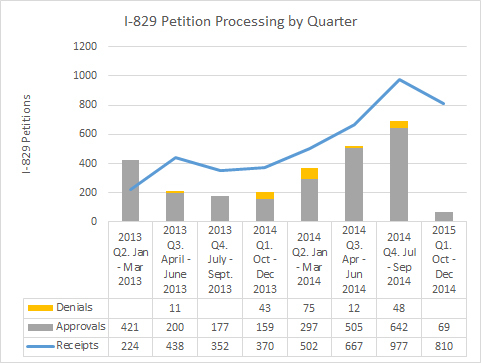 I hope that future processing reports will show IPO getting up to speed with I-829 and able to handle the growing backlog of petitions (3,080 of them as of 12/31/2014).